Horry County Democratic Party has teamed up with GINGALLEY Web Design & Promotions to offer its Supporters quality merchandise with fast delivery right to your door. All of the apparel products herein are produced in the USA and are printed using the direct to garment printing process. Horry County Democratic Party has partnered with GINGALLEY to offer merchandise for sale on its website. 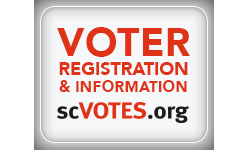 Any issues that may arise with a product offered on this website, its affiliate websites, or other official channels are handled exclusively by GINGALLEY for Horry County Democratic Party. We do not accept returns due to the customer ordering the wrong size – so review the size charts closely. INDEMNITY: You will indemnify and hold Horry County Democratic Party and GINGALLEY (and its officers, directors, agents, subsidiaries, joint ventures, employees, partners and affiliates) harmless from any claim or demand, including reasonable attorneys’ fees, made by any third party due to or arising out of your breach of this Agreement, or your violation of any law or the rights of a third party.